Canada’s Skull Fist is an old school metal outfit that I’ve been meaning to check out for awhile. I came across some positive reviews for this EP months ago and was lucky enough that the band passed along a copy to me. They play straight up ’80s style traditional heavy metal with helium vocals, speedy songs and a love for all things metal! “Sign Of The Warrior” and “Heavier Than Metal” a great combo to kick off the EP. 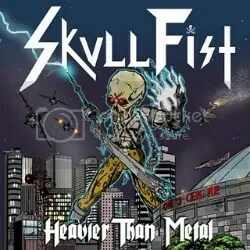 Both display the fury of guitars and drums perfectly along with Jackie Slaughter’s piercing vocals and are a great introduction to Skull Fist. I mean, if you don’t get where this band is coming from with a song like “Heavier Than Metal”, get outta here! “Blackout” is not the Scorpions song (which would’ve been really cool) but an original and easily my favorite track on the album I love the final minutes of the album, it feature some great guitar work. “Ride The Beast” is another highlight and “No False Metal” sounds like a Manowar song but it’s not quite as cheesy. You’ll be singing “NO FALSE METAL! !” along with Slaughter in no time! This EP shows a lot of promise for this band which I honestly believe could be the cream of the crop in regards to the retro-metal movement (yes, even more so than the much-praised White Wizzard), taking their place right alongside Blacktide. I really hope they get the opportunity to get into a studio and record a full album, I am very interested in listening to anything else they come up with.